A growing body of evidence suggests that sea levels, fed by the fallout of climate change, could rise by up to one million in the next century. The potential effect could be disastrous for the Egyptian agricultural industry that depends upon the Nile delta for survival. Throughout the Arab world there is an undercurrent of concern surrounding the question of climate change, particularly within the Egyptian agricultural industry. Egypt is one of the countries most vulnerable to rising global temperatures, according to the most recent report of the United Nations’ Intergovernmental Panel on Climate Change (IPCC), a collection of climate experts from across the world. This could not have happened to a country more dependent upon its agricultural industry. Farming was born in the floodplains of Egypt and it has been a driving force behind the country’s social and economic development. Today is no different; agriculture employs 34% of the work force and accounts for 17% of GDP and 30% of commodity exports. The question Egypt now faces is how to deal with the problem. In 1997, President Hosni Mubarak, announced a series of mega projects, to divert Nile water to the Western Desert and the Sinai Peninsula, with the aim of turning feddan upon feddan of barren landscapes into lush, cultivatable dwelling grounds. The projects were to cost more than LE300 billion and reclaim 3.4 million feddans of desert by 2017. Moreover, they would provide prime agricultural land from which urban desert cities could grow, easing the burden on the overcrowded Nile Valley. 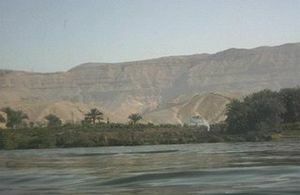 Toshka, south of Aswan, is the most ambitious of these projects. At a cost of LE 5.5 billion the project would see 5.5 billion cubits of water each year – equivalent to 10% of Egypt’s share of the Nile – diverted to an intricate desert irrigation system. The hope was to attract large-scale commercial farmers to the region, who in turn would bring investment, development, and ultimately, resettlement. However, public praise has not been forthcoming. Dr Mamdouh Hamza, owner and founder of Hamza Associates, a civil engineering firm behind the project, called it a failure. Designed to cultivate up 540,000 feddans, he said it has not even come close to reaching that figure. Last year former Minister of Construction and Housing Hasaballah Al-Kafrawi told TV show Al-Taba’a that Toshka was ‘useless’ and a ‘waste of billions’. At a number of these reclaimed sites inexperience of farming in desert environments has also led to gargantuan water waste. For centuries, farmers in the Nile Valley have irrigated their rice paddies and wheat fields by opening floodgates above sloping plots which allow water to move along mud carved channels before draining back into the river. However, modern desert farming demands ‘drip irrigation’ – permitting the farmer to control how much water is distributed at any one time. Failing to educate farmers about these methods means that vast amounts of water are wasted everyday. “Settlers would often come from the Nile Valley, move to a desert farm, and try to do exactly what they did in the Nile Valley.’ reported Dr. Tina Jaskolski, a researcher at the Desert Development Centre. Rather than relocating farmers to desert areas a range of other options have also been suggested. Dr Guy Jobbins, a senior program officer for the International Development Research Centre (IDRC), has suggested two extreme approaches. The first is to build a seawall along the coast that is strong enough to hold back the Mediterranean. However the costs of such a plan are astonishing. The Netherlands, most of which is below sea level, spends about $100 per capita maintaining a system of dikes to keep the sea out. In 2007, Hamza presented his own plan along these lines involving the construction of an embankment along the entire coastline and skirting it with a plastic diaphragm, which filters the water to prevent the intrusion of salt. Hamza estimates that his plan would cost LE 20 billion. When asked where this money would come from, Hamza says that it is the United States and Europe which are most responsible for climate change. ‘Those people should together pay the bill for what we need to protect our land’, he said.. The second proposed plan involves retreating seven kilometers, turning the land in between into salt marsh, and then building a wall. “Managed retreat will probably be the most cost-effective (strategy) in most areas, “ said Jobbins. Of course all of this depends upon the question of whether sea levels are rising or not and this is still in debate. Climate change scientists must make century long assumptions about pollution levels – the driving force behind rising temperatures – in formulating their models. And those levels are based more on policy than science. However, disregarding the ambiguous nature of the situation concerns are being raised by the agricultural sector and decisions will need to be made. Despite the potentially positive aspects of Hamza’s plan it is unrealistic to believe that the US and Europe will foot the bill. Jobbin’s plan will also face a negative reception unlikely to be welcomed by a public who would read nothing but ‘Retreat’ in such a plan. The next few years will no doubt be difficult for Egypt, both economically and socially. But if decisions do need to be made it is better done sooner rather than later.